Rescuers paused in Amatrice, ceItaly, where a 6.1 earthquake struck Wednesday morning. 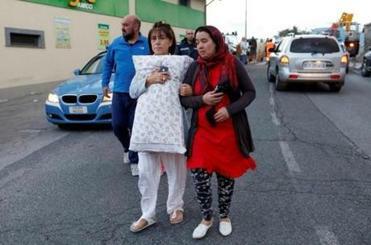 AMATRICE, Italy — Rescue crews using bulldozers and their bare hands raced to dig out survivors from a strong earthquake that reduced three central Italian towns to rubble Wednesday. The death toll stood at 159, but the number of dead and missing was uncertain given the thousands of vacationers in the area for summer’s final days. Residents wakened before dawn by the temblor emerged from their crumbled homes to find what they described as apocalyptic scenes ‘‘like Dante’s Inferno,’’ with entire blocks of buildings turned into piles of sand and rock, thick dust choking the air and a putrid smell of gas. A number of towns suffered heavy damage in Wednesday’s earthquake. ‘‘Unfortunately, 90 percent we pull out are dead, but some make it, that’s why we are here,’’ said Christian Bianchetti, a volunteer from Rieti who was working in devastated Amatrice where flood lights were set up so the rescue could continue through the night. 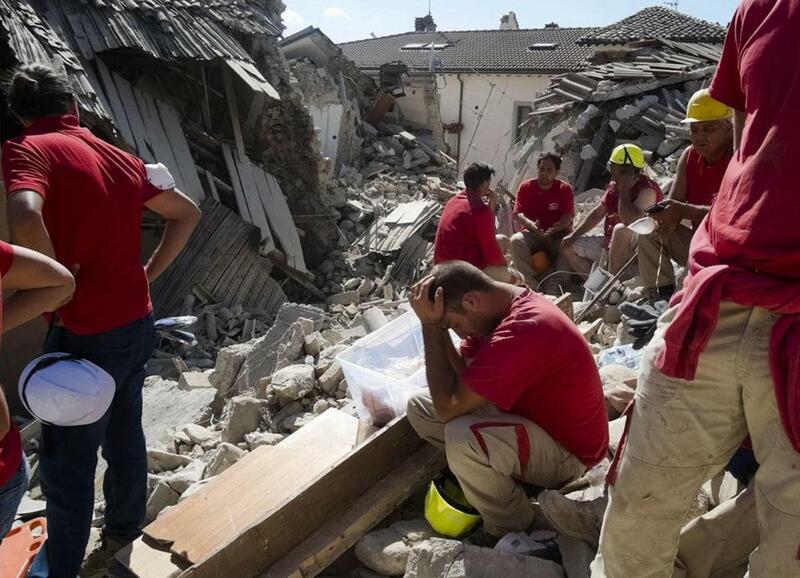 Premier Matteo Renzi visited the zone Wednesday, greeted rescue teams and survivors, and pledged that ‘‘No family, no city, no hamlet will be left behind.’’ Italy’s civil protection agency reported the death toll had risen to 159 by late Wednesday; at least 368 others were injured. The birthplace of the famed spaghetti all’amatriciana bacon and tomato sauce, the city was full for this weekend’s planned festival honoring its native dish. Guests filled its top Hotel Roma, famed for its amatriciana, where five bodies were pulled from the rubble before the operation was suspended when conditions became too dangerous late Wednesday. Among those killed was an 11-year-old boy who had initially shown signs of life. ‘‘We need chain saws, shears to cut iron bars and jacks to remove beams. Everything, we need everything,’’ civil protection worker Andrea Gentili told The Associated Press in the early hours of the recovery. Italy’s national blood drive association appealed for donations to Rieti’s hospital. 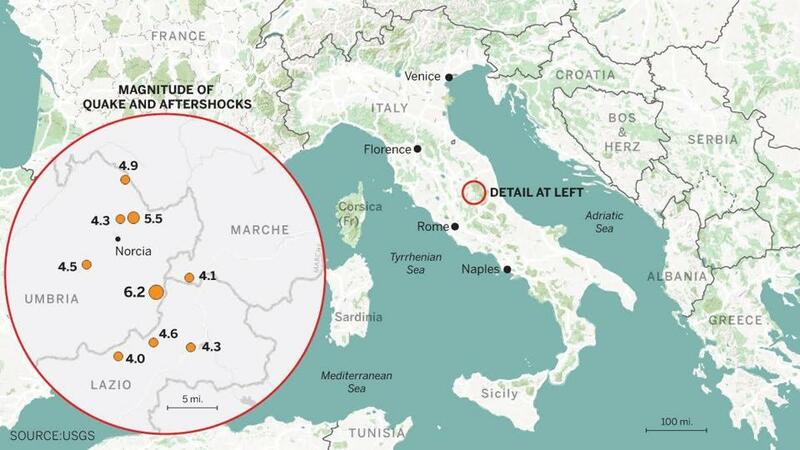 ‘‘The Apennine mountains in central Italy have the highest seismic hazard in Western Europe and earthquakes of this magnitude are common,’’ noted Richard Walters, a lecturer in Earth sciences at Durham University in Britain. ‘‘There are broken liquor bottles all over the place,’’ said Gino Petrucci, owner of a bar in nearby Arquata Del Tronto where he was beginning the long cleanup. ‘‘I hope they don’t forget us,’’ he told Sky TG24. President Barack Obama, speaking by telephone to Italian President Sergio Mattarella, said the U.S. sent its thoughts and prayers to the quake victims and saluted the ‘‘quick action’’ by first responders, White House spokesman Josh Earnest said. 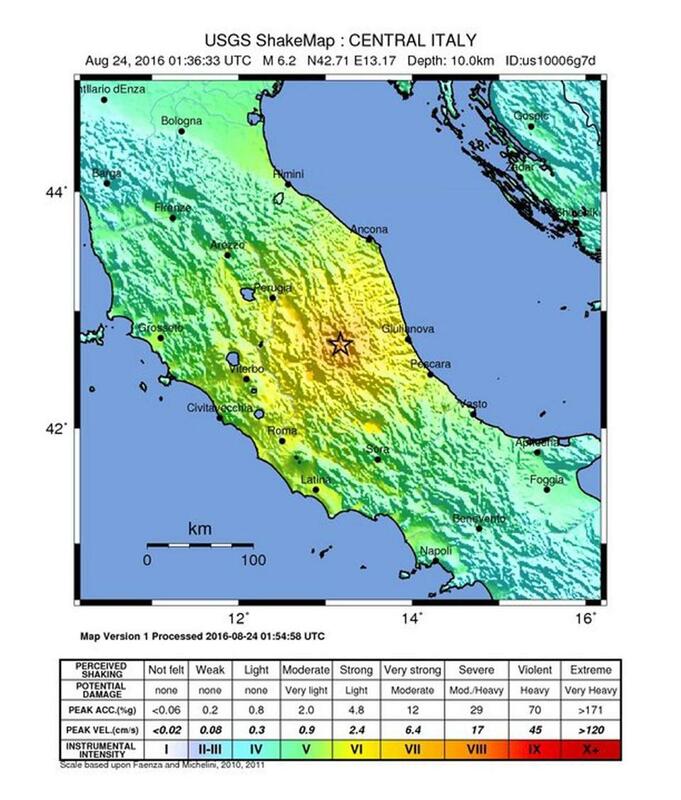 A handout released by the US Geological Survey shows the location of a 6.2 magnitude earthquake in Italy. Nicole Winfield reported from Rome; Valentina Onori in Amatrice and Fulvio Paolucci in Illica contributed to this report.